More than £3m has been spent on the Manor House Golf Club at Castle Combe since its acquisition by Exclusive Hotels and Golf Clubs in 1994 to establish it as one of the South West's premier golf, business and social venues. Together with its famous sister hotel, The Manor House, it has been recognised as one of the top play-and-stay destinations in the world. The golf course and clubhouse are always immaculately presented while the natural drainage ensures excellent year-round play so often denied in the South. The clubhouse offers both the informal Spike Bar with an extensive menu, and the Woodbury Restaurant with it brasserie style Table D'hote Menu. The Manor House Golf Club boasts a Michelin Star restaurant, and offers facilities for large golf events, meetings and conferences and is a stunning setting for both wedding ceremonies and receptions. From M4 J17 or J18, follow Brown signs to Castle Combe Racing Circuit. From J17, pass the circuit, and on entering Castle Combe follow the Brown signs. 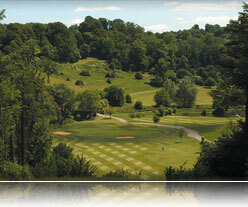 From J18, as you enter Castle Combe the golf club is on the right. Designed by Peter Alliss, who claimed "there can be no finer setting for an English golf course," the 6,500-yard championship course is recognised as one of the toughest around. 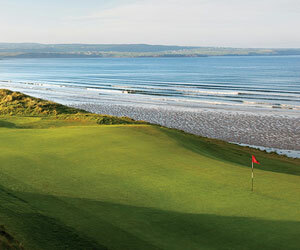 Nestling in an area of outstanding natural beauty are some of the most memorable and challenging holes you will play. From the stunning par-5 12th that traverses the Bybrook valley to the signature 17th that presents you with a 40-meter drop to the green, the course delights at every turn. A full range of practice facilities is available, with a USGA spec driving range, putting green and pitching green with practice bunkers.